When fears of recession are in the air it seems obvious that people would cut back on luxury fashion purchases, but according to many up-market fashion outlets in the UK and US that is not happening at present. What they have noticed is that women are instead focussing on luxury products that they feel are good investments. The latest buzz words in the fashion world are ‘slow fashion’ and ‘investment dressing’. An excess of consumerism and short-lived fashion fads is giving way to a focus on quality and classics. People are buying fewer items but making sure they are good quality and that they will last, returning to old style values that the truly chic have never abandoned, those of building up a wardrobe of stylish classics that you can combine and re-combine to give yourself a uniquely elegant look. For example, rather than splashing out on a frivolous dress that will only get one wearing, many women now prefer to spend a considerable amount buying an excellent quality winter coat, which they will wear day after day and which represents very good value when you consider its cost-per-wear ratio. The trend is moving away from short term ‘disposable fashion’ with fads that change from season to season, towards up-dated classic styles, like the belted trench coat or the pea coat, that will last for a long time and see you through several winters. Boutiques in London report that they are selling out of the most popular styles of winter coats already, such is the demand. We have noticed the same tendencies in the handbag world too. Quality is the benchmark and women are choosing classic styles in top quality leathers as investments, knowing that this is the bag they will be wearing everywhere they go and that it is one of the most important statement-making fashion items they will buy this year. Frivolous novelty handbags are staying on the shelves, while classic Birkin and Kelly style handbags, structured totes and frame bags in crocodile, python and ostrich are in demand. A winter coat is important, but when you enter a restaurant you hand it over. It is your handbag that stays with you every moment of your day, your handbag that needs to be at once versatile, comfortable and elegant, look good both with your coat and the outfit you are wearing underneath, be practical and comfortable enough to keep all your things easily accessible and above all beautiful enough to inspire you with confidence and complement your whole image. 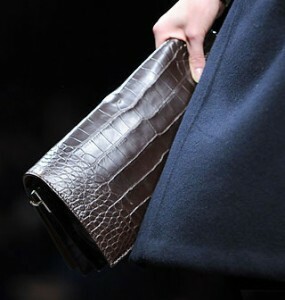 With all these roles to fill it is easy to see why it is so important to invest in quality when you buy a new handbag. Good quality leathers, both calfskin and exotics like python, ostrich and crocodile, actually improve with use and age, as long as they are well cared for. They become more supple and take on a subtle patina that advertises their quality. While cheap handbags will lose their shape, fade and become dull, or maybe even come unstitched after a few outings, a quality bag will last for years – many crocodile handbags have become family heirlooms, handed down from mother to daughter and treasured. The secret of buying a future heirloom is to choose a classic style that will always be in fashion. Look at the Kelly bag that has been fashionable for upwards of fifty years! Bear in mind the ‘slow fashion’ criteria too, when you select a handbag. Look for a handbag that has been ethically produced, created by skilled artisans that have been paid a proper wage, rather than in exploitative sweatshops. Look for a handbag that has been produced in one country, not flown around the world notching up air miles and a huge carbon footprint, to have a strap sewn on in one country, a label in another etc. Above all when buying exotic leather handbags make sure it comes from an approved and documented source, with appropriate certification, so that it is not contributing to illegal poaching of endangered species. A handbag that has been ethically produced in this way, is much more likely to be of high quality – a 100% Made in Italy label is a good guarantee of this, usually indicating that a product has been hand-crafted by expert Italian artisans, who have been in the leather industry for generations and produce beautiful handbags with love and care, that are infused with Italian style and quality. One thing is for sure, when you choose your handbag carefully, you really will be able to enjoy it for years and have the satisfaction of knowing that you have invested your money wisely … and, what is more, you get to enjoy your investment every single day!